Skull Island is an ongoing series of lectures, films and installations that examine a hypothetical image environment as an introspective space that reflects the sociopolitical contexts of its audience. Using the fictional island from King Kong as an analogy, cultural and technological developments define a relative position from which the viewer can view and question their surroundings. The development and presentation of this work through different disciplines and in different contexts aims to enact the shifting material and environment it sets out to identify and critique. 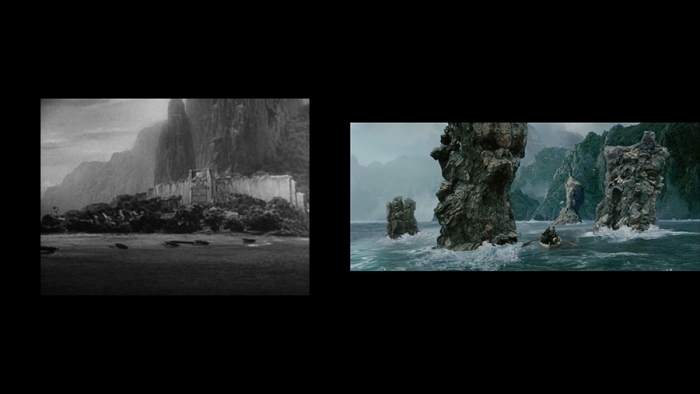 Part I compares the tangibility of the island in the original 1933 King Kong to the CGI environment rendered for the 2005 Peter Jackson remake, opening up wider questions of the potential for subversion in contemporary digital image making technologies.